Union Minister for Textiles and Information & Broadcasting, Smriti Irani addressing at the presentation ceremony of the ‘Women Transforming India Awards 2017’, organised by the NITI Aayog, in New Delhi on August 29, 2017. The Niti Aayog on Tuesday awarded 12 women to recognize the transformational impact of work undertaken by women across India's villages, towns and cities. 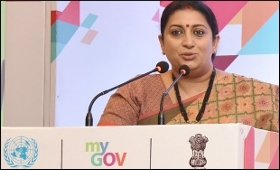 Union minister Smriti Irani and Niti Aayog Vice Chairman Arvind Panagariya presented the awards at the event. The campaign this year, to promote equal opportunity of women, has received an overwhelming 3000 entries from across the country. Speaking at the event, Irani said, "It is a great opportunity for me to be here among these wonderful women who have such inspiring stories." "You don't hear such stories everyday. These stories need to be told. We are going to do something so as to bring across these stories of change to the whole nation," she added. She further said that the stories from previous year's awards will be combined along with this year's and reached to the people through some medium. The list of winners included Kanika Tekriwal, a self-made aviation entrepreneur and cancer survivor from Bhupal, Madhya Pradesh; Harshini Kanhekar, India's first woman firefighter, from Nagpur; Kamal Kumbhar from Osmanabad, Maharashtra who broke free from the shackles of poverty and a suffocating marriage to create a micro-enterprise network. Women Transforming India Awards was launched by NITI Aayog, in partnership with the UN in India and MyGov.